Multi-state compliance doesn’t have to be scary. With zero posting violations handling the largest corporations in America, our enterprise solutions make 100% compliance a breeze. You know the risks associated with workplace compliance management. That’s why LaborLawCenter prides itself on having the most knowledgeable team of compliance experts in the nation. Our Complete State & Federal workplace posters ensure your locations display all necessary and up-to-date postings. Automated poster replacement plans empower you by minimizing risk while maximizing compliance awareness. And our thousands of HR compliance, training, and safety products make LaborLawCenter the complete solution to your compliance needs. Enterprise poster management is easy with LaborLawCenter. Additionally, our 100% Compliance Guarantee ensures you’re protected from any and all posting violations. ZERO Posting Violations managing the largest corporations in America. It’s why thousands of corporations trust LaborLawCenter to manage their poster compliance programs, year-round. Our 20,000 square-foot warehouse is engineered to handle even the most intricate corporate shipping requirements. Whether you have 10 locations in one state or 1,000 nationwide, we’re ready to help streamline your year-round shipments. Our corporate compliance guarantee is simple. If at any time you receive a posting violation or fine, we will cover the fine. In our over 13 years of keeping workplaces compliant with posting regulations, we have yet to receive a single violation. All enterprise accounts are kept in-the-know of any and all labor law changes. What’s more, a team of experienced compliance experts are a call or email away with answers to your most basic or complex questions. Our online account management system allows you to easily access, audit, and update shipping addresses, customization requests, and more. Multiple users and roles allow you to choose who gets access and control privileges for empowered team management. It’s our goal to make enterprise compliance as simple as possible. We understand the need for customized shipping, printing, and logistics for large corporations. Having serviced thousands of corporations for over a decade, we pride ourselves on our competitive pricing and billing. Schedule a consultation and see how our adjustable payment schedules, invoices, and pricing can match your requirements. Request a FREE no-pressure phone consultation to discuss your compliance goals and ask questions along the way. We’ll walk you through our variety of poster solutions while offering useful guidance on how to stay 100% compliant, year-round. Simply click the button below to begin! Does my business need a labor law poster? All businesses with one or more employees are required to post labor laws. How many posters do I need for compliance? With our all-in-one State & Federal poster, you only need 1 per location. Which labor laws need to be posted? In order to achieve compliance, you must post both State & Federal laws. Can I purchase separate State and Federal posters? 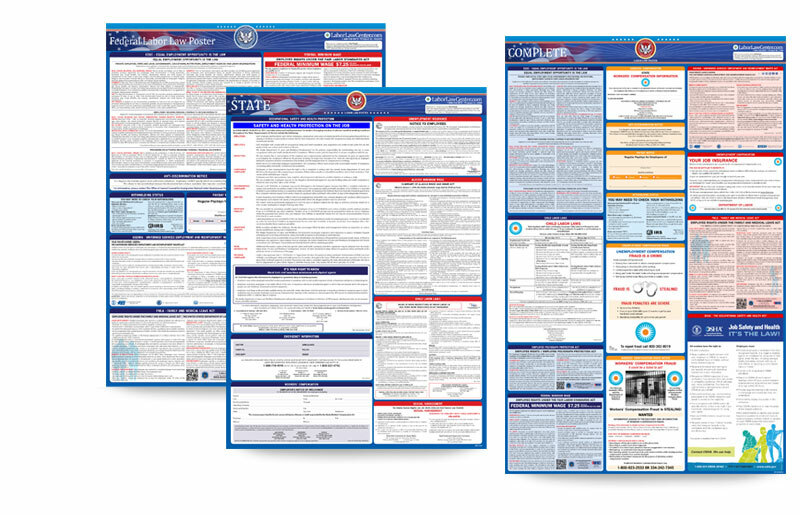 Yes, we do carry individual State and Federal labor law posters. Where should labor law posters be placed? Labor law posters must be posted in an area frequented by employees. What happens when labor laws change? You’ll need updated posters—our Auto-Replacement program ensures you’ll have them!